Jake came home from work on his birthday to discover a yoghurt container full of bright green fiddlehead ferns. 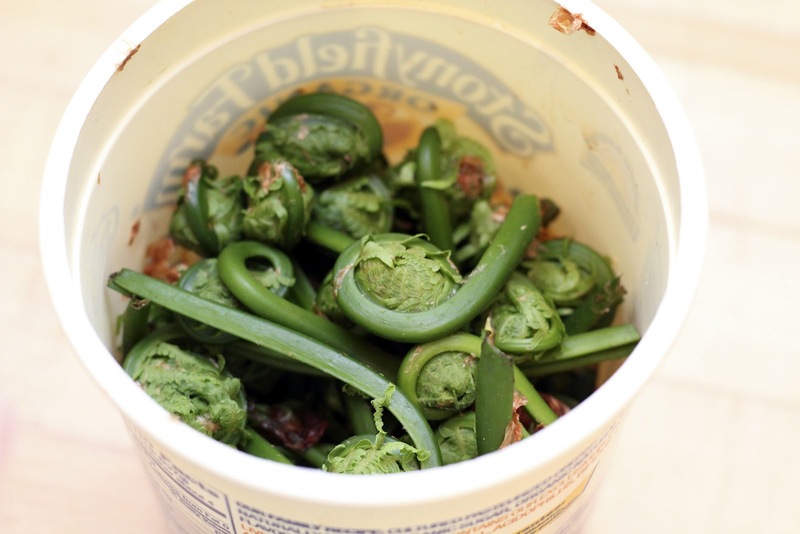 Now, there is only one person who would think to give Jake fiddlehead ferns on his birthday and it's not Silka. It was our neighbor and family bestie Scottie Mills! Scottie has been a huge inspiration for The Butcher & The Baker posts - it was her Easter Brunch we wrote about a week ago, she was at the seder we wrote about two weeks ago, and it was her cousin's goat cheese farm that we wrote about a few months ago. But her influence goes way back - her cows were the ones Jake grew up eating and she was the one to teach Jake how to forage. Scottie's fiddlehead gift perfectly summed up why we're here - to be in a strong community of great people who savor their relationship with local food and the environment. Because the foraged curlicues are such a short-lived treat (much like ramps) we kept our preparation simple. 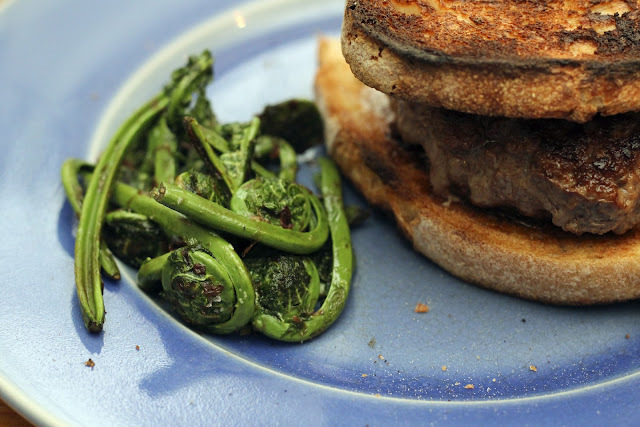 With their grassy and slightly nutty flavor - almost a cross between asparagus and an artichoke heart - all they need is a little olive oil and garlic... just like Scottie taught us. Pour them over linguine or pile them up next to a burger and you've got yourself the perfect spring meal. 1. Melt butter in a 12” pan on med-high heat. 2. After butter stops foaming, put in garlic. 3. 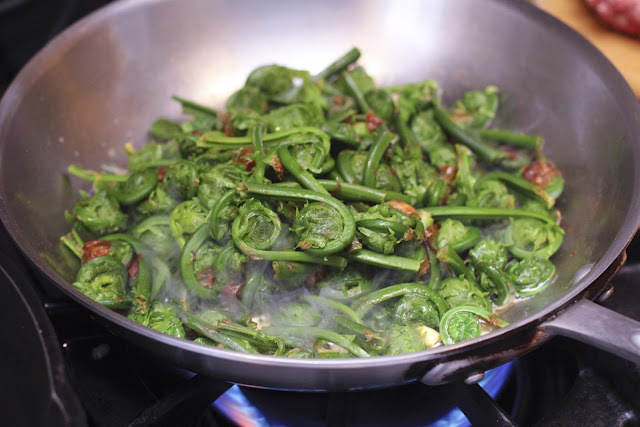 After garlic starts to soften, add fiddlehead ferns. Shake pan occasionally. 4. 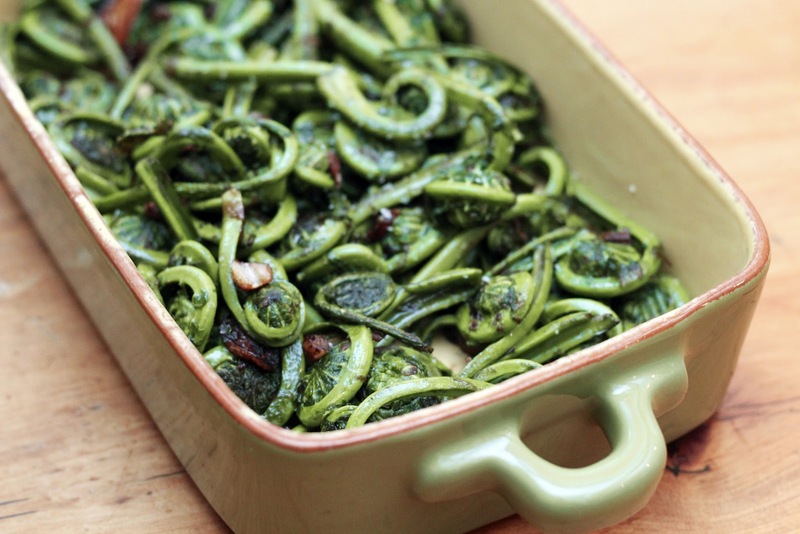 When the fiddleheads are dark green and tender take off heat and serve - about 5 minutes.